These cookies are a favorite amongst family and friends - one family member and one friend in particular! 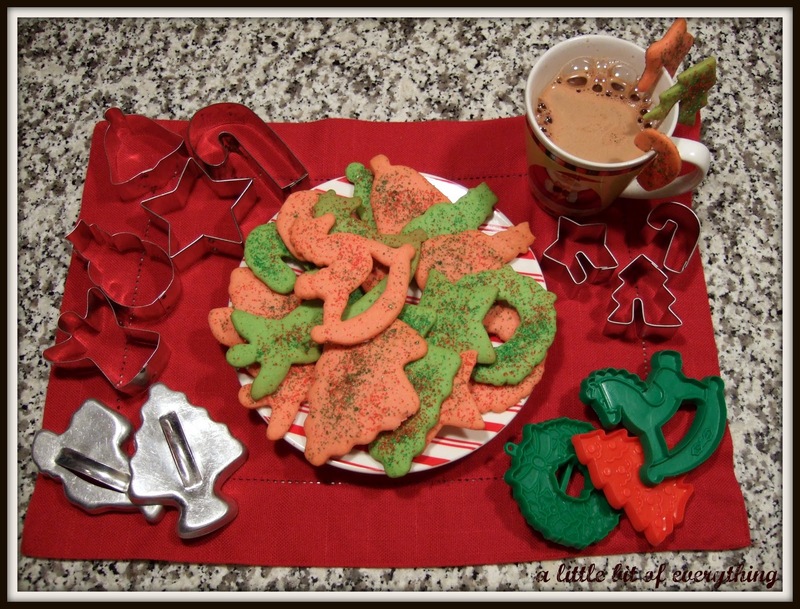 I have been making them for many years using most of these cookie cutters some of which belonged to my mother. 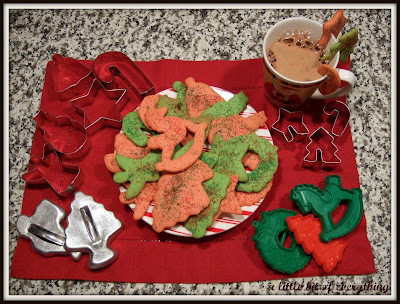 The red and green ones are Hallmark and the small cutters, a recent purchase, are Wilton and are made to hang on the side of a cup, as shown. Tasty cookie that rolls out easily into any shape you like for any occasion. I roll these out thinly so that will be crisp when baked. Cream butter and sugar. Add beaten egg and milk. Sift flour and baking powder together, adding half of it at a time to the above mixture. Add vanilla. See Note. Bake in a preheated 400' oven for 10-12 mins. [I use 350' for 10-14 mins.] Transfer immediately to a rack to cool. These cookies freeze well so can be made in advance. Note: You will probably need more flour - use enough to just keep dough from being sticky. Dough rolls out well and makes great cookies in any shape. Initial roll might be sticky so add more flour and re-roll. You can tint dough red and green for Christmas, orange for Halloween, red for Valentine's Day, green for St. Patrick's Day etc. Also great for cutting out numbers or letters for party favors. Recipes can be copied and pasted for printing. Variation: Add 3 ounces of melted unsweetened chocolate along with other ingredients for chocolate sugar cookies. You will need about a cup more flour as well to attain the correct dough consistency. I love them well done -- yum! How cute to hang 'em off a mug of hot chocolate.....perfect for dipping! Thanks for linking up to Making Your Home Sing Monday! Yummy!! Thanks for linking these too! Those look so cute and convenient the way they hang off the cup. Have a great day. I LOVE the way they can hang off the tea cups! I have never seen that before! 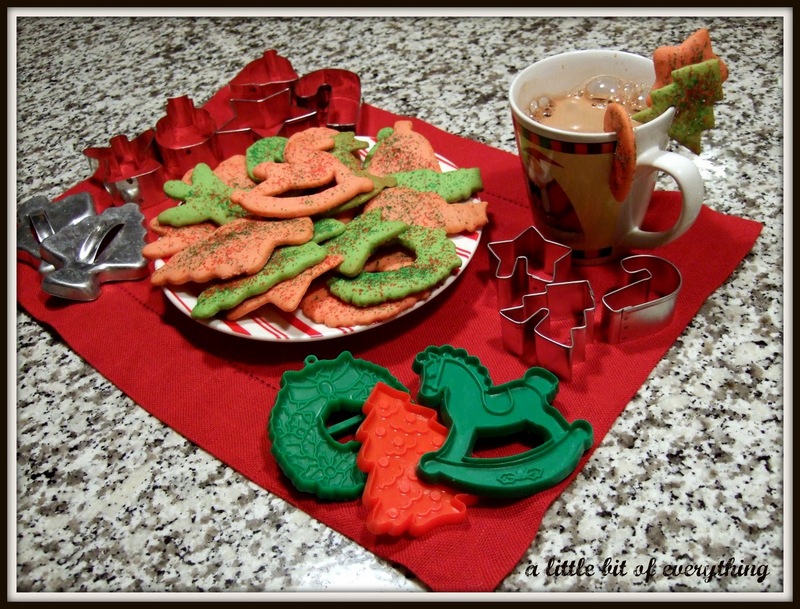 I loved seeing your cookies, how wonderful have some of your Mother's cookie cutters! I adore the cookies hanging on the cup. Thank you for joining me for Tea Time. Love the recipe! Merry Christmas! Yummmm! I just made some Cream cheese Sugar Cookies that came out wonderful. I iced them with white glaze and silver and gold sprinkles. I really enjoy your blog. A great way to celebrate the day, with some of those cookies, coffee, and using red plates. Great job. Thanks for sharing your recipe - the chocolate variation sounds yummy too! Love those cookie cutters you found for the side of the cup! Too cute! Love your cookies! Thanks for sharing!! Lovely site. I am stopping by to invite you to come check out week 5 of Thrifty Thursdays. Happy New Year! click to learn how-don't be missing out !! Please follow Me Through Google Friends Below! Thanks! I've Been Awarded and Featured...thank you so much! Labels-click a topic to see more!